Q. How far in advanced should I book my wedding? 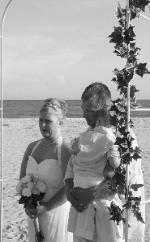 October 1st to book your 2011 wedding. Q. What if it rains and I have purchased a wedding package? A. 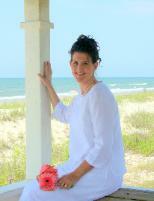 We will use a banquet room at a local hotel or somewhere in Oak Island. Q. We want to release Doves. Do you release them in the rain? A. I love my birds and a little rain is okay. Thunderstorms are not okay! Q. Where are the weddings held on Oak Island? Q. Will there be lots of people sunbathing around us? left the beach by then. Q. Can I bring my own minister? 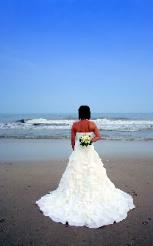 choose a beach wedding package. Sorry, no exceptions. Q. Where can we stay on Oak Island? be sure to tell them we referred you! Q. Who can do my makeup? Who can do my hair? A. Jen Banks is an EXCELLENT makeup artist. Q. Where can we eat for the rehearsal dinner and/or reception? Q. Is there nightlife on Oak Island? Q. I got a speeding ticket while here, what should I do? Q. The groomsmen want to go fishing. Where should they go? Q. Do you recommend any realtors? I want to look at property. A. Dorothy Essey Century 21 on Oak Island or Margaret Rudd & Assoc. Q. I would like live music at my wedding. Any suggestions? Q. I would like to rent chairs and tables for a party after the ceremony.